From February 3 to 5, 2016, the Grade 2 class from École St. Thomas d’Aquin in Medicine Hat were on campus taking part in a community classroom. 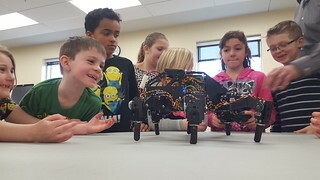 Over seven instructors and staff from the college volunteered their time to provide a variety of learning opportunities ranging from robotics to human anatomy. Jennifer Holowachuk, part-time instructor in the Division of Science & Health, explains that during the coordination of these sessions, there was no shortage of staff and faculty interested in getting involved. “Community classrooms are a great way to build an engaging and eye-opening experience for young students. They are a creative way to spark their imaginations and expose them to a variety of topics in different settings,” says Holowachuk. Holowachuk believes that there is a long-term relationship that is built when students are brought onto campus at an early age. Terry Kennedy, principal and teacher at École St. Thomas d’Aquin says that his students really enjoyed their time on campus and that it was a very positive experience. MHC is one of several community classrooms in the region; others include destinations like Cypress Hills, Medalta and the Esplanade. Kennedy explains that the College was a way for his school to “get their feet wet” and that he already has other teachers looking at planning similar excursions.